Welcome to this week's edition of the Healthy Holiday #BostonPotluck! If you missed the other posts from Boston bloggers, check out a ground turkey & zucchini lasagna from Simply Gourmet in Southie, curried millet with butternut squash at One Beet Wellness, and dairy free jalepeno popper from Eat. Live. Blog. Follow along the potluck on social media with the hashtag #BostonPotluck! Champagne Thursday shares her recipe next week. Today I am sharing a festive, fresh, and "skinny" cocktail for the holiday season. My go-to drink when out and about at bars is a vodka (typically Tito's) with club soda and a squeeze of lemon & lime. This past summer, I switched it up and got some muddled cucumber instead of lemon & lime and love how light this drink is! I decide to create a spin on this drink for #BostonPotluck. It's so easy and has minimal ingredients. 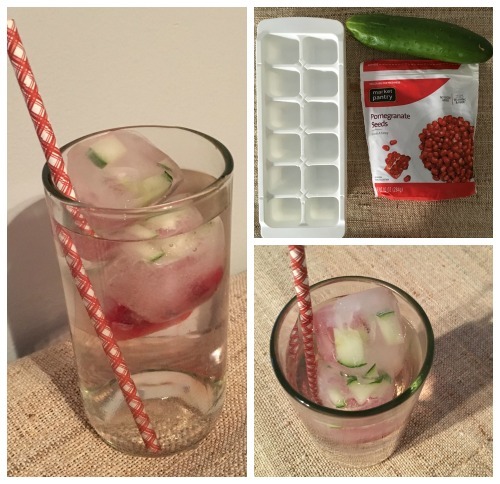 Fill your glass of choice with the ice cucumber and pomegranate cubes. Pour 1/4 cup of vodka then 1/2 cup of club soda. Also as part of the #BostonPotluck, 5 readers(!) have a chance to win one of 11 cookbooks from The Harvard Common Press, including Paleo Planet, Good Cheap Eats in 30 Minutes (or Less! ), Not Your Mother's Slow Cooker Cookbook, and more! Enter below! 5 winners will be chosen on January 11, 2016.